Taking comfort to new levels. Constructed from state-of-the-art Thunderbike Power and New Monica fabrics with minimal seams. A revolutionary design with honeycomb silicon grip on the inside of the shorts preferred over an elasticated finish. Results in a tight secure fit which adheres evenly across your skin. Taking comfort to new levels. Constructed from state-of-the-art Thunderbike Power and New Monica fabrics with minimal seams. A revolutionary design with honeycomb silicon grip on the inside of the shorts preferred over an elasticated finish. Results in a tight secure fit which adheres evenly across your skin. The Nat chamois, with antishock and ice-effect Next gel core keeps you cool and protected even after long hours spent in the saddle. The braces are seamless and super-elastic ensuring you avoid a constricted feel. Ideal for even the tallest riders. 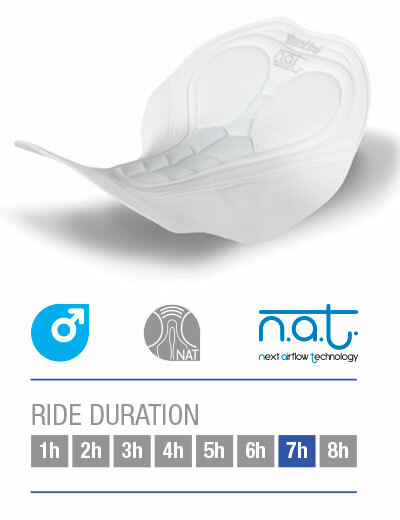 NAT (NEXT - Airflow - Thermoshock) is a revolutionary new chamois with triple advantages. It is the first Santini padding with a NEXT core: Thermoshock gel cushioning enclosed between two foam layers ranging from 2 to 4mm thick. Airflow ventilation provides continuous cool air circulation. The top layer is an antibacterial microfibre that guarantees maximum hygiene while in contact with the skin. At the base of the padding, two anatomical wings in soft microfibre protect the most sensitive areas from irritation and soreness.